As promised here are some current photos of Ike. He is finally starting to look more mature and there is a hint more weight on him. If only I had his metabolism. I think he could have spent all day in this part of the yard. He follows me around like a puppy dog so trying to get a head shot is challenging; there are a lot of close up nose shots that get deleted. It took some squawking birds to distract him so I could get this photo. Begging Mom for one more treat before she leaves. 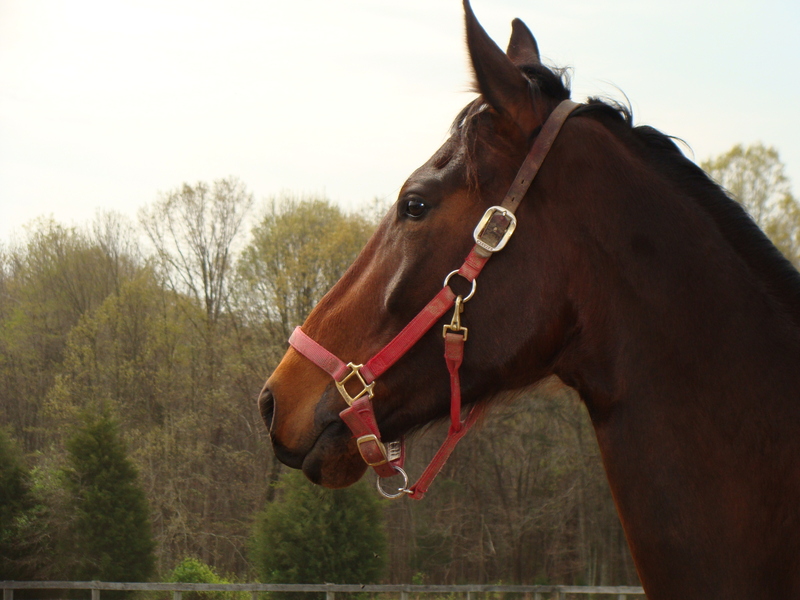 Finally, one of his “brother” Cigar, my retired off the track Thoroughbred. If you look closely you can see where he has chewed a chunk out of the pallet that is leaning on the fence. Action shots will be upcoming. These days it seems that we are always available. There is the home phone, cell phone, work phone, maybe even a work cell phone. Don’t worry if you are talking to someone, most of us have call waiting and voicemail, so there is no worry that you will miss any important offers from the newest telemarketer. We have laptops, iPads, and internet access on our phones. How many email accounts do you have? If you Google ” cell phone holder for horseback riders,” you can find various holders to strap to your leg so you never need to miss a call while sitting astride your horse. While this could be useful while on the trails in case of emergency, I find that I like to disconnect during my time with Ike. The only time the phone comes into the barn is while waiting for the vet or farrier. The barn is my escape from the constant bombardment of everyday life. I escape into my alterego of Super Rider. OK, so I’m not a Grand Prix rider, but I can dream. For the two or three hours I’m at the barn, I am fully present. In the 6 years I’ve taken dressage lessons, I’ve learned that 1) I know next to nothing, and 2) the more I know, the harder it is. I’ve got to block out the external noise to really focus to make my body parts do what they have to do at the very moment they can affect the horse’s movement. If I lose focus, then poor Ike stands little chance at succeeding. Right now steering Ike is more like turning a Mac truck without power steering. I need all the focus and strength I’ve got. We only have 30 days until the show. p.s. I promise to post a more recent photo soon. I brought the camera today, but that “focus” thing got the best of me and I forgot I brought it until after my lesson was over. So we are now on the clock and counting down to our first real entry at A. Thirty two days, tick tock, tick tock. The show is at HITS Commonwealth Park in beautiful Culpeper, Virginia (http://www.hitsshows.com/culpeper/index.html). Ike will debut at Intro Level and try all three Intro tests offered. The beauty of these classes is there is no need for me to register Ike with USEF or USDF to enter these classes…horse registration is not cheap (but nothing with horses really is). We get the licensed show atmosphere and judges at a slightly less expensive rate. This show venue is one of the closest to the barn, so we can spend the night before at home and return home right after the show. Can you imagine being 3 years old and having your mother leave you in a strange place by yourself? Perhaps I’m being a bit overprotective. There will be plenty of future shows that will have sleepovers with his new neighbors. This venue was also the place where Ike’s “older brother” reached the pinnacle of his dressage career (said with sarcasm dripping from my tongue). We achieved a 78% one a Intro test and came home with a Champion ribbon from the 2009 USDF Adult Team Competition. The highlight for Cigar was getting to do a victory gallop. The dressage test performance was just a means to the end. Hopefully Ike will want to achieve a similar result and look forward to achieving similar results in the other levels. Stay tuned. Windy spring day in Virginia with a seasonable temperature of 65 but winds were steady around 20 mph with stronger gusts. 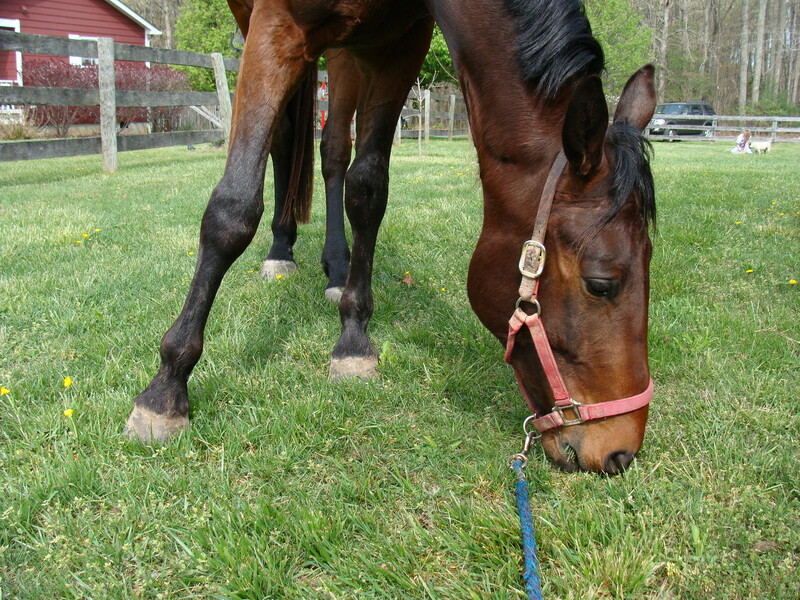 Although he could not cope with the winter winds while pretending to graze in his paddock, Ike is typically cooperative under saddle even on the most blustery days. He faired better than I did today. While I rode, the nose was runny and the eyes tearing from the combination of wind and pollen. It is a really special look. Not really sure why it has not caught on as a trend. We had a few moments of defiance during our warmup- no acrobatics or airs above the ground, just a little resistance to listening to my aids as we fed off onto a circle. A couple of one rein flexes later, we were back in our groove and had some hint of flexion and bending around my leg. We’ve starting incorporating basic dressage test movements into our work in preparation for our first centerline of the season on April 29th. Turns onto and off of centerline have some sway, halts have haunches shifting to the right, and the long diagonals are a tad wavy. Getting the right lead canter is a 50/50 proposition. I have to keep reminding myself that HE IS ONLY THREE! Patience young Jedi, patience. Seems like I have a knack for owning horses who were born in Florida. Cigar is from Ocala, and Ike came from Wellington. Needless to say that it was fun to watch as Ike adjusted to a Virginia winter, albeit a mild one. 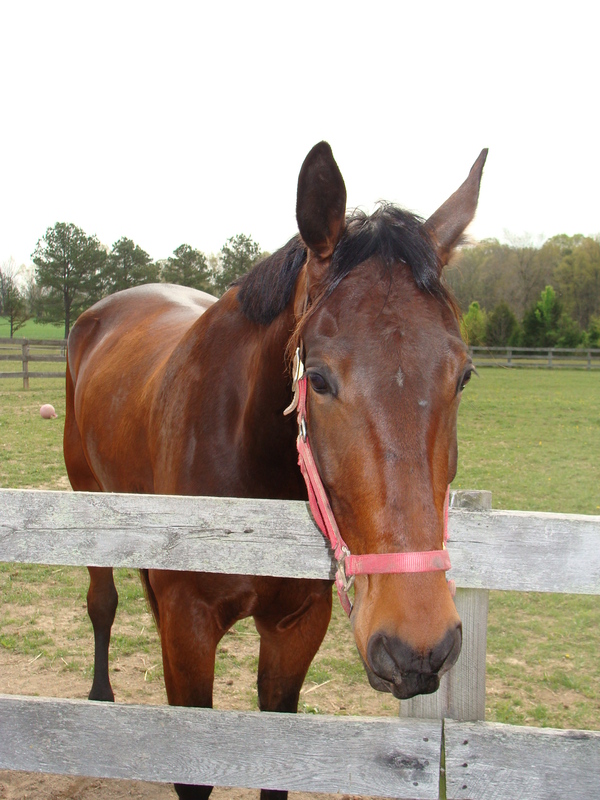 We learned that he is not a fan of cold wind and rain – he quickly earned the title of Fair Weather Fairy (FWF) at the barn. When the cold moved in but no winter coat appeared, he experienced a blanket for the first time. The poor boy trembled the first time he wore it. 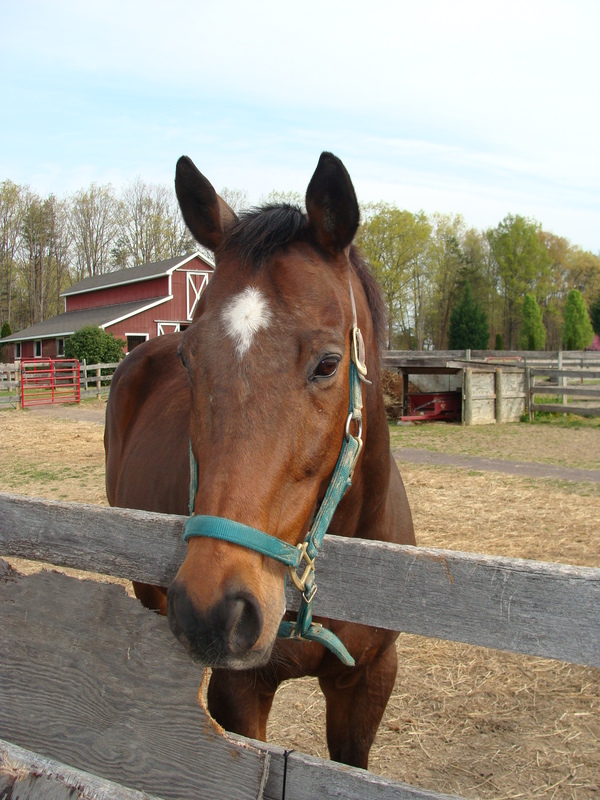 The first time he went to his paddock wearing the 84 inches of plaid, he kept looking back at his body. His head would whip around and he’d sniff one side and then he’d check out the other. Ike then started trotting faster and faster, finally breaking into a gallop around the perimeter. He stopped suddenly, whirled his head around and I’m pretty sure he was thinking, “Oh, shucks, it is still there.” Never seen a horse try to run away from a blanket. Leave it to my boy to try. He almost made it through the winter without any measurable snow, but finally in February, a couple inches appeared overnight. He was turned out as usual, but the FWF pushed the snow off the fence, pawed the ground, and started running. “What is this white stuff everywhere?!?! Hurry, hurry, get me back in my stall!” He hid in his stall until the offending snow melted later that day. I think Ike would have found a way to move back to Florida if we had a winter like we did in 2009-2010 when we counted the snow accumulation not in inches but in feet. Hunters have deer season, Elmer Fudd has “wabbit season,” and equestrians have mud season. The season started early this year because of the unseasonably warm winter. I have survived 9 years of mud season with my Thoroughbred Cigar. His nickname is pigboy for a very good reason. I was hoping that Ike would not be a fan of the mud, but as luck would have it, he too is a pigboy. As I approached his paddock this morning, I knew I would have my work cut out for me. Both sides were caked on mud. His mane and tail had clumps of mud. I’m not sure how he was able to see through the fly mask for all the mud smears. There was some serious consideration of just grooming the saddle and girth area and leaving the rest. My OCD won out and I groomed the entire body. There was dust and hair flying everywhere. Such a lovely feeling to have gritty teeth. When I was done, I was dirtier than Ike, or so I thought. Upon exiting the barn into the daylight, I then noticed all the spots that I missed. Ooops. No wonder Cigar stuck his tongue out as we’d ride by. Must have been his opinion of my grooming skills. Had a short but productive ride. Continued to work on our body control on circles. Ike is now back in his paddock, any bets on how long he stayed clean? One would think that loading your horse that trailered to Virginia from Florida would be an easy task. How wrong that line of thinking was. Ike lulled me into a false sense of confidence when he hopped on the Keifer slant load and headed to a clinic last fall. We hitched it up again in February for another clinic. He showed some reluctance to load after the second clinic was over, but after 15 minutes gave up and hopped aboard. We noticed then that he was a bit cramped with the slanted stall, soooo we traded in the Kiefer for a lovely Twi-Lite straight load with extra long stalls to accomodate Baby Huey’s expanding dimensions. 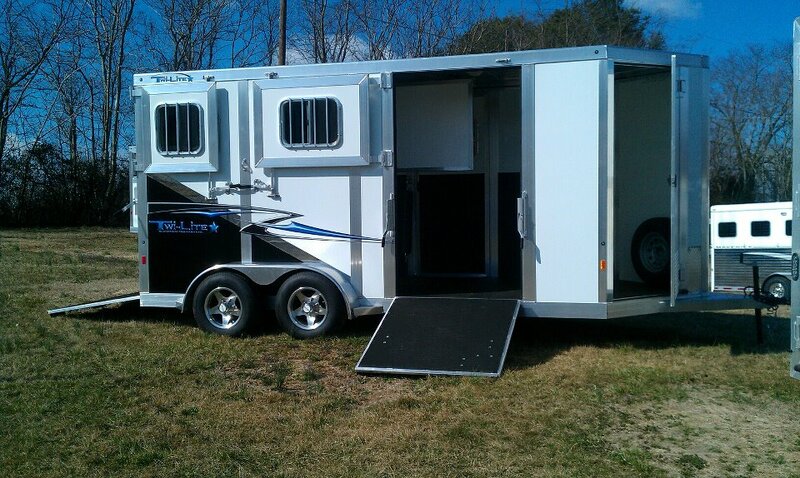 Clinic #3 was scheduled for early March, so the new trailer was hitched, the tack was loaded, and we just needed the horse. After 2 hours, my ever patient husband noted that we would not make it by our prescribed ride time and that I needed to decide what to do – give up or muster on. I knew we could not give up, so my saint of a trainer came out and we worked for three hours before there was success. Had to resort to the “If you want your dinner, you will eat it on the trailer method.” Yes, I know, bribery is not the ideal method. I like to think of it as positive reinforcement. It works wonders with the dogs, and it is working with Ike. He will now walk right on the trailer when he sees me holding that pink bucket. Practice makes perfect, so hopefully this chapter is closed and we can move on to the next challenge.